An integral part of the course in plastics technology which is run by the University of Applied Sciences in Diepholz (PHWT) involves giving the students the opportunity to apply the theoretical knowledge they have acquired through their studies to practical real-life scenarios which occur in busy manufacturing facilities. OMEGA TECHNOLOGY PLASTIC GmbH & Co. KG in Diepholz provides students with an opportunity to see what they have learned in the lecture theatre applied in practice. 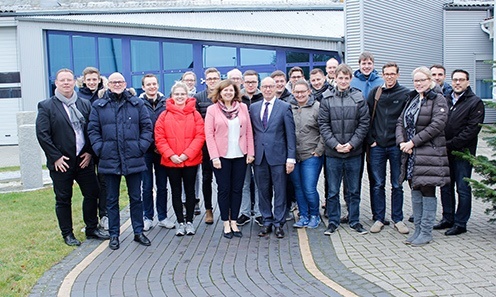 Members of the management team Ilona and Walter D. Olbert and Jürgen Exner took the opportunity to welcome to OMEGA a group of aspiring mechanical and industrial engineering graduates who are under the tutelage of Professor Bye at the PHWT. After the students had been welcomed to the company, they were given the opportunity to explore some of the theories that govern plastics testing. Several students gave a presentation on their experiences of analysing different types of engineering grade thermoplastics which they were able to work on during the previous two semesters of theoretical courses at the Centre for Materials and Engineering. After the group had finished going through the theoretical aspects, Walter D Olbert took the students on a tour of the company. Mr Olbert described the plastic production cycle in detail starting from preparing the materials and the injection moulding process right through to delivering and storing the finished parts.